Nicholas performed on Show 320 in Lubbock, TX, on February 27, 2016. 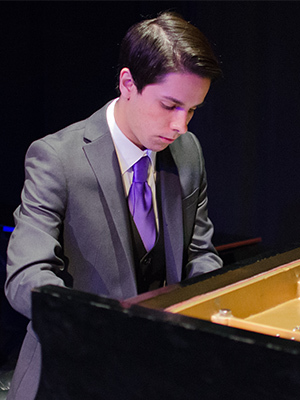 Nicholas Mendez (piano), 16, is from Pasadena, California, where he is home schooled through the Verdugo Academy. He studies music with Jeffrey Lavner and Jean-Yves Thibaudet at the Colburn School in Los Angeles. His parents enrolled Nicholas in piano lessons before he could read. He has participated in the Colburn Academy Honors Piano Trio, the Yellow Barn Young Artists Program, and the Aspen Music Festival. Outside of music, Nicholas enjoys playing chess, ice hockey, and reading. Nicholas is a Jack Kent Cooke Young Artist.